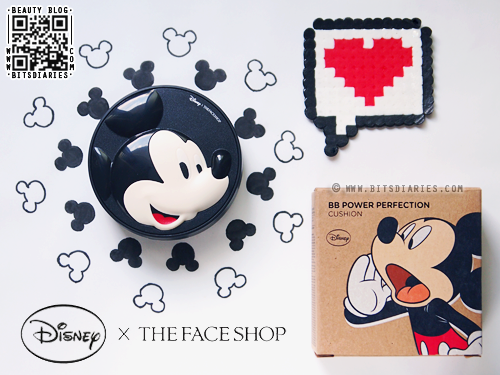 Last week, I posted a review of The Face Shop x Disney BB Power Perfection Cushion. 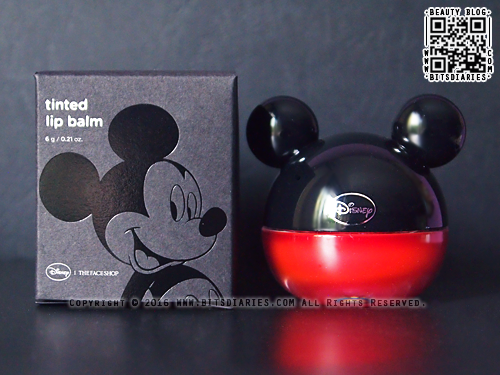 And today, I will be doing a review of The Face Shop x Disney Tinted Lip Balm. Formulated with Vitamin E, The Face Shop x Disney Tinted Lip Balm moisturizes the lips and adds vibrant and lovely color to lips. It is available in two colors — 01 Brilliant Red Sun and 02 Sweet Rich Pink. And I got the red one. Recently, The Face Shop collaborated with Disney and launched a new set of irresistibly cute makeup products. I got my hand on one of their cushion compacts, which is the Mickey Mouse BB Power Perfection Cushion. There are three types of BB & CC cushions, and each of them has a different Disney character designs – Winnie the Pooh, Monsters Inc. Mike and Mickey Mouse. 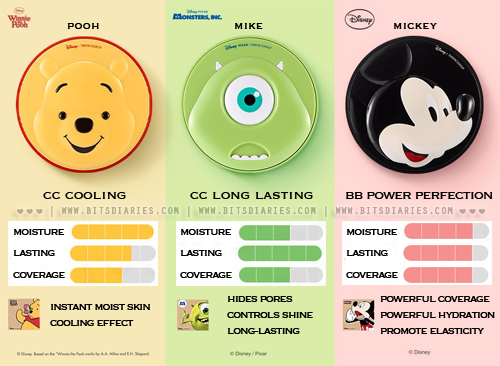 - Winnie the Pooh is a CC cooling cushion that provides skin with instant moisture and cooling effects. - Monster Inc. Mike is a long-lasting CC cushion that provides coverage for pores and controls shine. - Mickey Mouse is a BB cushion that offers powerful coverage for imperfections. The Winnie the Pooh cushion has SPF 42 PA+++, while the other two have SPF 50+ PA+++ that protect skin against harmful UV rays. They all have anti-wrinkle and whitening properties and are available in three shades – V103 Pure Beige, V201 Apricot Beige and V203 Natural Beige. Despite all your best efforts in taking care of your skin, you might still see some pesky pimples surfacing on your face occasionally. After some time, they get healed leaving behind red-brown marks/scars on your skin that seem to take forever to fade. Using topical scar treatment products will help promote healing and accelerate the healing process. Look out for products that have whitening properties and contain anti-inflammatory ingredients like salicylic acid and tea tree oil, as they work to reduce inflammation, kill bacteria and unplug blocked pores. For the past one month, I have been treating my acne marks/scars with a new topical treatment called the Etude House AC Clean Up After Balm, which I will be doing a review today. It is a revamped version of AC Clinic Red Spot Balm. Many people with oily, acne-prone skin tend to skip moisturizer as they feel that moisturizer is their enemy, but that's a big mistake! Our skin naturally produces sebum to keep it moisturized. When skin is dry, it produces even more sebum to compensate for the dryness, and this may increase the chances of getting clogged pores. If you have oily, acne-prone skin, pick a non-comedogenic and oil-free moisturizer that has anti-acne ingredients like salicylic acid and tea tree oil. My personal all-time favorite moisturizer is the Etude House AC Clinic Gel Lotion. But it has been revamped with a new look and improved formula, and it's now called AC Clean Up Gel Lotion, which I will be doing a review today. 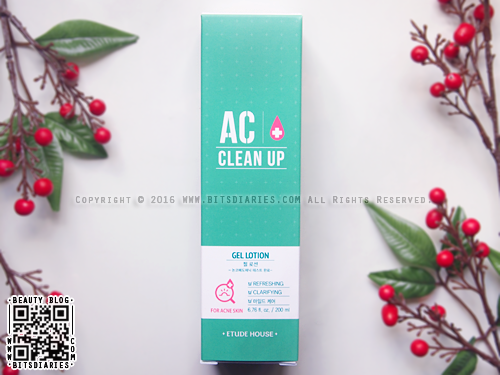 The Etude House AC Clean Up Gel Lotion is a non-comedogenic moisturizer that contains salicylic acid, tea tree oil and madecassoside to treat and prevent acne troubles from arising, while moisturize and soothe the skin.